Hello darlings! Hope everyone is starting 2017 so well! It's been a little rough because I've been sick since the beginning of the year! So fun, right?! But, the best thing about being sick is getting to catch up on shows and researching for the best new things, so I hope you enjoy the new posts I've put together for the style blog and POP! FIZZ! CLINK! The dress I've styled was the dress I wore on NYE and totally forgot to post about it! It was sold out until a week ago so now you all can enjoy it, if you fancy! 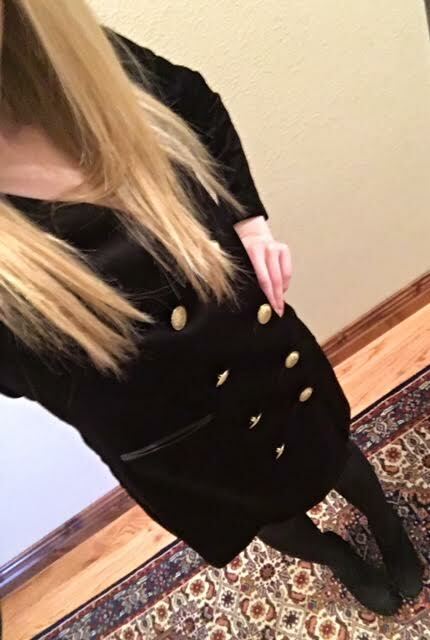 While looking for this dress I knew I wanted something velvet, because I'm so obsessed with it right now, and something warm! I was in Colorado for NYE and the weather called for freezing temps so a lightweight dress was not an option! I found this on ASOS and instantly fell in love! I've wanted to invest in a Balmain blazer for a while, but haven't pulled the plug just yet and when I saw this, I thought it was a fantastic alternative! With the black velvet, gold button detailing and the gorgeous double breasted feature- I knew this would be a beautiful statement dress. I paired it with black tights (gotta stay warm) and black suede ankle booties. What did you wear on NYE? Are there any other Balmain-esque pieces you've found?! Comment below! Oh no! You missed a post?! Follow me on Bloglovin' to stay in the know!